Gary Ostrower taught at Alfred University since 1969, and has been the Joseph K. Kruson Distinguished Professor. He is a former Fulbright Lecturer. He serves as the ombuds officer at both Alfred University and at St. Bonaventure University in Olean, NY. In 2012, Ostrower lectured nationally on C-Span about World War II. 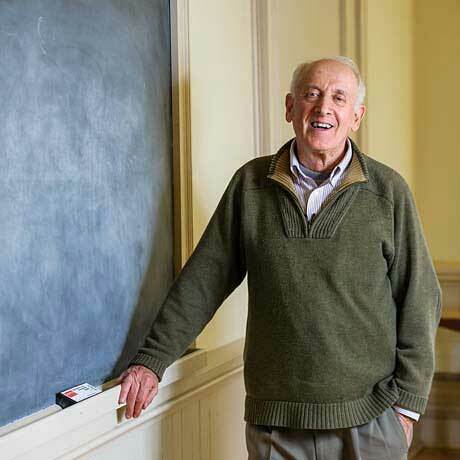 In December of that year, FacultyRow named him as a "Super Professor," one of 400 nationally. Born in 1939, Ostrower grew up in Woodbridge, NJ. He received his BA in 1961 from Alfred University where he studied under David M. Leach, a specialist in US intellectual and diplomatic history. He then attended the University of Rochester where he received an MA degree in history (1962) and a PhD in history (1970), having studied under Akira Iriye. He has taught at Vassar College (January 1967 to June 1968), and was a visiting assistant professor at the University of Pennsylvania (1979-80). He has spent most of his teaching career at Alfred, where he has been the Margaret and Barbara Hagar Professor of the Humanities. He has won numerous teaching awards. Ostrower served as president of the Society for the Study of Internationalism from 1988 to 1994. The organization, founded by internationalist historian Warren F. Kuehl, promoted and publicized academic study in the field of international cooperation. From 1999 to 2005, Ostrower served as mayor of Alfred NY. He had been a Republican member of the Village Board of Trustees for the previous eighteen years. He also served six years as a county liaison to the New York State Assembly in Albany, and was a member of the Allegany County Youth Board from 1984 to 2011. He was a long-time commentator on a local radio station, and coached his son's Little League team for three years. His hobbies include jogging (he hates it), tennis (he loves it), and both golf and skiing. He admits to great pleasure outrunning college students one-third his age. Ostrower served as a Fulbright Lecturer at Aarhus University in Denmark during the spring semester, 2005. He taught courses dealing with the Vietnam War and with American History from Truman to Clinton. He also researched on topics related to the United Nations. He is currently conducting research about a Nazi propagandist who renounced his American citizenship in 1940. He is married to Judith E. Samber, formerly Allegany County Court Judge and presently a judicial referee for the State of New York. They have two children, Sarah and Peter. Specializing in the history of international organization, Ostrower has authored three books about the subject. Two deal with the League of Nations. The first was published in 1979, titled COLLECTIVE INSECURITY: THE UNITED STATES AND THE LEAGUE OF NATIONS DURING THE EARLY THIRTIES (Bucknell University Press). It focuses on U.S. use--and nonuse--of the League during the Manchurian Crisis and concludes that American policy fell victim to confused and contradictory goals (such as the desire to promote collective security and the desire to avoid war). In 1996, Avery Publishing Group, a subsidiary of Penguin Putnam, published THE LEAGUE OF NATIONS: FROM 1919 TO 1929. This is an illustrated survey of the League's first decade, the initial volume of a two-part history of the organization. The second volume, which covers the 1930s, was authored by the late George Gill of Fordham University. In June 1998, Twayne Publishers, a Gale Publishing (Macmillan Library Reference) imprint, published THE UNITED NATIONS AND THE UNITED STATES, 1940-1998. This is part of the Twentieth-Century International History series, edited by Akira Iriye. As a broad survey of U.S.-UN relations, the book concludes that American policy toward the UN has been characterized by uncertainty and inconsistency. Nevertheless, writes Ostrower, the US will continue to need the UN as much as the UN needs the US. Ostrower has contributed articles to encyclopedias, historical journals including International Organization and The Historian, and has reviewed books for many journals including the American Historical Review and the Journal of American History. His c.v. provides a full statement of his professional activities. His e-mail address is: ostrower@alfred.edu, phone is 607-871-2999 or 871-2217 (secretary). Fax number is 607-871-3366. His mailing address is: Division of Human Studies, Alfred University, Saxon Drive, Alfred, NY 14802.